This study presents an evaluation of the role that cartilage fibre ‘split line’ orientation plays in informing femoral cartilage stress patterns. A two-stage model is presented consisting of a whole knee joint coupled to a tissue-level cartilage model for computational efficiency. The whole joint model may be easily customised to any MRI or CT geometry using free-form deformation. Three ‘split line’ patterns (medial–lateral, anterior–posterior and random) were implemented in a finite element model with constitutive properties referring to this ‘split line’ orientation as a finite element fibre field. The medial–lateral orientation was similar to anatomy and was derived from imaging studies. 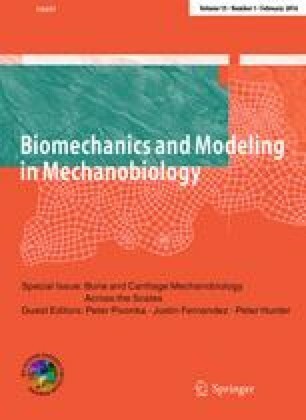 Model predictions showed that ‘split lines’ are formed along the line of maximum principal strains and may have a biomechanical role of protecting the cartilage by limiting the cartilage deformation to the area of higher cartilage thickness. This work was funded by the Health Research Council Emerging Researcher First Grant (11/496) and Wishbone Trust research grant.